The latest-and-greatest Apple phones were the iPhone 8 and X. The X was nearly a grand, and the 8 wasn’t a whole lot cheaper. That’s a lot of scratch for a device that I want to carry around in my pocket where it’s at constant risk for loss, theft and damage. I had the thought that there weren’t any compelling, must-have features in the newest phones. We’re past the point where each new generation of phones brings significant new functionality. I had pretty much decided that I’d be happy with an older-generation phone where I wouldn’t have to be constantly stressed about losing or damaging it, when Woot posted some “scratch and dent” refurbished iPhones on sale. 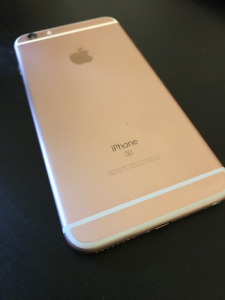 I snapped up a 6s Plus in pink rose gold for $340, moved my Project Fi SIM card into it, and I was set. I did lose some Fi functionality: I’m now restricted to the T-Mobile network (with a proper Fi phone, you’ll automatically switch to Sprint or US Cellular when their coverage is better), but Tmo coverage is good enough around here. I still have the Nexus, and can schlep it along when I’m traveling to places that otherwise have spotty Tmo service. As a bonus, Google will also give you (yes, give—they even pay shipping) data-only SIM cards so devices can connect for cellular data on your same plan (you only pay for data usage). I recently upgraded (and downsized) from the 6s Plus to an iPhone 7 (also from Woot) and that went smoothly as well. My suspicions were confirmed, in that I find that I am much more comfortable using a $300 phone than I ever would be carrying a small, delicate, $1,000 object in my pocket. I’m sure there are people for whom the higher-end features are well worth it, but I just have a bit too much anxiety to take that kind of risk.